Alizadeh, S., Pazoki, A., Habibi, H. (2013). Effect of Ascorbate and Gibberellin on Some Morphological Traits and Relative Water Content in Fenugreek (Trigonella Foenum Graecum L.) Under Different Levels of Salinity Stress. International Journal of Advanced Biological and Biomedical Research, 1(11), 1436-1451. Soheil A. Alizadeh; Alireza Pazoki; Hasan Habibi. "Effect of Ascorbate and Gibberellin on Some Morphological Traits and Relative Water Content in Fenugreek (Trigonella Foenum Graecum L.) Under Different Levels of Salinity Stress". 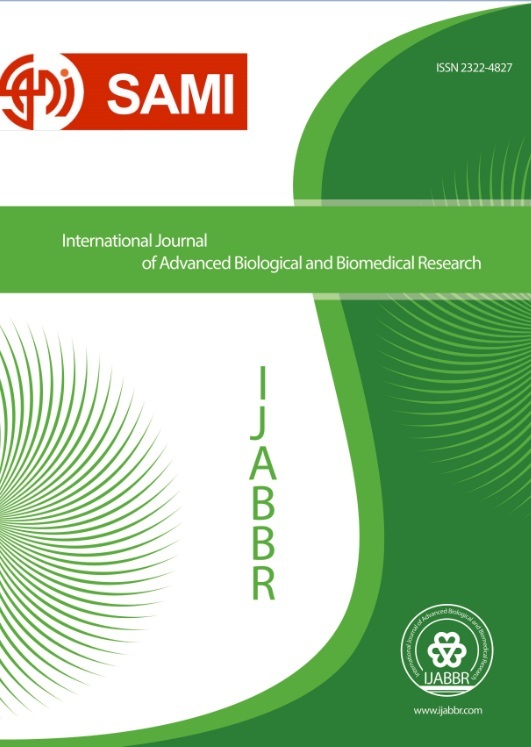 International Journal of Advanced Biological and Biomedical Research, 1, 11, 2013, 1436-1451. Alizadeh, S., Pazoki, A., Habibi, H. (2013). 'Effect of Ascorbate and Gibberellin on Some Morphological Traits and Relative Water Content in Fenugreek (Trigonella Foenum Graecum L.) Under Different Levels of Salinity Stress', International Journal of Advanced Biological and Biomedical Research, 1(11), pp. 1436-1451. Alizadeh, S., Pazoki, A., Habibi, H. Effect of Ascorbate and Gibberellin on Some Morphological Traits and Relative Water Content in Fenugreek (Trigonella Foenum Graecum L.) Under Different Levels of Salinity Stress. International Journal of Advanced Biological and Biomedical Research, 2013; 1(11): 1436-1451. To evaluate the effect of ascorbate and gibberellin on some morphological traits and relative water content of medicinal plant fenugreek in different levels of salinity, an experiment was carried out in Shahr- e - Rey branch of Islamic Azad University in October 2012. The experiment was arranged as factorial experiment in the basis of completely randomized design with four replications. The experimental factors included four salinity levels (0, 30, 60 and 90 mM), three ascorbate levels (0, 3 and 6 mM) and two gibberellin levels (0 and 2 mM). The results showed that, the simple effect of salinity, gibberellin and ascorbate on experimented traits were significant. Except double effects of gibberellin and ascorbate on stem length, leaf area interaction effects of salinity and ascorbate on relative water content, all double and triple interaction effects on experimented traits were not significant. The findings of the salinity simple effects indicated that, increase in salt concentration reduced the amount of concerned traits. So that the lowest biomass, vegetative growth and RWC were obtained in salinity by 90 mM. Gibberellin and ascorbate application could decrease adverse effects of stress, so that, by spraying these compounds on the plant, an increase was observed in leaf vegetative growth and relative water content.